Can Cockroaches Really Survive A Nuclear Explosion? No, cockroaches cannot survive a nuclear explosion. While they may be able to withstand extreme radiation exposure due to the simple design of their bodies and slower cell cycles, they certainly cannot tolerate the high amount of heat energy produced following the explosion. Cockroaches are fine when they’re grounded, but you know that stuff is getting serious when you see one whip out its wings and start flapping around your head. It’s at that precise moment that you will start running around like a terrified little child, but don’t worry, we’ve all been there! Cockroaches have been hanging around on this planet for about 200 million years now, i.e., since the Jurassic period (when dinosaurs were still alive and well). That’s a long, long time, which means they even survived the asteroid that killed those massive creatures. The myth that cockroaches will inherit the Earth in the event of nuclear warfare surfaced shortly after the United States dropped atomic bombs on Hiroshima and Nagasaki in 1945. Reports claimed that the ancient insects were the only survivors in the rubble of the wrecked Japanese cities. What exactly are these buggers made of that enables them to survive such unbelievable energy and destructive force? Therefore, in order to test the credibility of the claim that “Cockroaches can survive nuclear warfare”, the Discovery Channel team subjected a set of German cockroaches to determine just how much radiation they could bear before finally succumbing to it. They used three levels of Cobalt-60 metal. They started with a baseline exposure of 1,000 radon units (rads) of cobalt-60, which is capable of killing a person in 10 minutes, and followed it up with 10,000 and 100,000 rad exposures on separate groups of roaches. For reference sake, the bomb dropped on Hiroshima emitted radioactive gamma rays at a strength of around 10,000 rads. The cockroaches finally gave in at 100,000 rad… unbelievable! 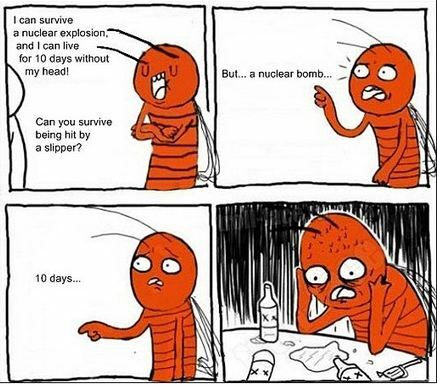 How Could Cockroaches Survive a Nuclear Explosion? Cockroaches’ ability to withstand extreme radiation exposure is due to the simple design of their bodies and slower cell cycles. Cells are said to be most sensitive to radiation when they’re dividing, but given that a typical cockroach only molts about once a week, and its cells only divide within a 48-hour period during that week, about 3/4 of the cockroaches exposed would not be particularly susceptible to damage by ionizing radiation, at least, relative to those whose cells were currently dividing. Humans are so vulnerable to these types of radiation because our cells are constantly undergoing changes and renewing themselves. The results confirmed that cockroaches can survive a nuclear explosion in relation to the radiation, but they would still succumb to the high amount of impact that the bomb produces if they were exposed. This stuff makes me wonder: What sort of wild toxins do they have to put in the likes of Hit and Baygon? Ishan is a Mechanical Engineer from Mumbai University, India and is obsessed with science, food and all things football. He is a self proclaimed cyclist, runner and a professional procrastinator.